The highly popular Star Trek and Star Wars franchises have created impromptu light saber battles, endless comparisons, rivalry, and related films Trekkies and Fanboys. Author Matt Robeck’s 256-page book pits various elements from each franchise into a presentable collection/summarization ideal for fan debate. Do not judge the book by its cover here. Readers will not see the official font only because it is not an official book. Endless comparisons, similarities, and differences provide constant entertainment while Forbeck provides accurate information for new franchise visitors or die-hard fans. Jeremy Bulloch, who played Boba Fett, contributes a foreward for the Star Wars side while Tim Russ, who played Tuvok in Star Trek: Voyager, represents the other side. Tuvok wins the foreword showdown, but this one does not add to the overall showdown score tally. The beginning part, subtitled “People” contains eight chapters while the next four parts all contain three chapters each – Part II: Gadgets, Part III: Time and Space, Part IV: Society and Culture, and Part V: Prepare for Impact. This simple format mirrors the numerous Star Trek film sequels and Star Wars “Episode” films. Each element contains a satisfying summary section plus the entertaining showdowns culminating with an overall good vs. bad showdown at the end. Some references like a Death Star death toll become debate magnets while providing yet another matter-of-face reasoning why the franchises succeed best – the sci-fi escapism that audiences really care about and even would consider living in. Readers might have unwelcome trips back to reality due to a few missed spaces, but can enjoy the related blog hosted by the publishers who also offer discounts on bulk purchases in the back of the book. Forbeck provides adequate background and helpful summary sections where he mentions movie and television stars who portrayed each given character. He even provides general types and sub-categories like “Scoundrels” for his Han Solo vs. Captain Kirk showdown. Each showdown has a unique perspective depending on the reader (male vs. female, etc. ), so Forbeck wisely mentions his approach/ground rules that include time, place, and related characters. Franchise fanatics can endlessly scrutinize these showdown rules, which create even more interest without producing an unnatural experience where readers feel like they are in a non-stop commercial. For example, Chewbacca throws down with Work who is also incorporated into the Captain Picard vs. Obi Wan Kenobi fight. Double appearances from Emperor Palpatine, Darth Sidious, Q, and Darth Vader also occur, but Forbeck does not repeat the same summary/background information for each. The overall showdown winning justifications are simple explanations like “both great, Star Trek has more” for Chapter 7 – Monsters. 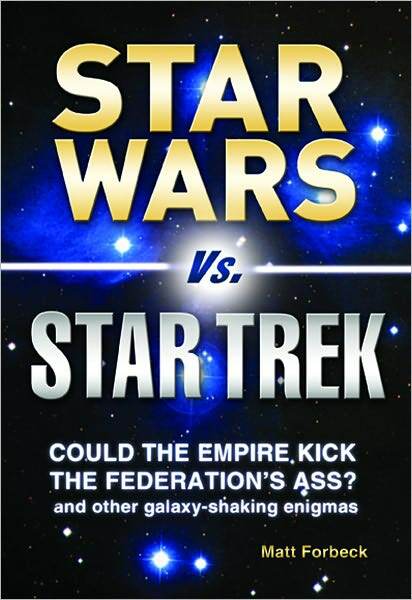 Star Wars wins big in weapons, starships, but Star Trek gains ground in planets. Not all showdowns are fights (e.g. C3P0 vs. Data) while supplementary elements like video games, movie box office tallies, critical acclaim, merchandising, and even music themes also add to the overall showdown tally. All the showdowns entertain on a relatively high level. Fans looking for specific matchups and multiple entries can check the index, but the page-by-page linear reading experience works well here thanks to the trivia and categories. Readers can appreciate nice tidbits like the origin behind Mace Windu’s purple light saber. Readers can solidify knowledge or learn more by completing quizzes with the corresponding upside answer key at the end of each chapter – 20 total quizzes and 120 total questions. Publishers wisely print a black tab each quiz near the top page so thumb readers can find them easily. Complete each quiz before reading each chapter to test your true knowledge. Fans obviously have a deeper understanding (references, etc. ), so they can enjoy this book on a higher level. The book has no real narrative so readers just recall their own experiences; analyze their own thoughts on each franchise and have fun debating. The discovery, new level readers might have a hard time imagining and visualizing the excitement. Minimal artist renderings and visuals would have helped tremendously here. “Unofficial” visuals or thumbnail sized pictures would also provide some learning elements so readers can recognize characters and related elements. This book not only ignites the franchise experience, but also Forbeck’s overall format. For example, bracket views in the single tally system would also enhance the book. A huge NCAA Basketball bracket-type system might have created more interesting matchups, but would have also created a navigational nightmare – not ideal for the book media. Maybe possible sequel books feature duos and trio showdowns. Readers will likely imagine scenarios where Luke, Han Solo, and a young Obi Wan Kenobi would take on Spock, Kirk, and Bones at the same time. Overall, Forbeck succeeds with the book and successfully forges two franchises (a la Marvel vs. Capcom) into an enjoyable experience. He also thanks his main supporters like Peter Archer and Phil Athans plus each franchise creator – George Lucas (Star Wars) and Gene Roddenberry (Star Trek). Hopefully we never see the day both franchises mesh in a movie (a la Alien vs. Predator) due to decreasing popularity, which does not seem likely especially considering the upcoming Star Wars 3D films and revitalized Star Trek film series – both coming in 2012. I sense another showdown! This entry was posted in Book Reviews and tagged Film, Michael Siebenaler, Mike Siebenaler, Star Trek, Star Wars, Tall Writer. Bookmark the permalink.